We would like to take this opportunity to thank you for visiting our website and extend a warm welcome. Our goal is to provide you with advanced specialist dentistry in a caring environment. Dr. Kayne's comprehensive knowledge of dental physiology and function, along with continual advanced training, ensures that we continue to maintain the highest standards of specialist care. Our treatment philosophy is to help you preserve your long-term dental and overall health. Few people realize that 25% of the population is without teeth, due primarily to periodontal infection of the gum and underlying jawbone. This infection also gets into the bloodstream and affects other areas of the body, greatly increasing the risk of heart disease, stroke and numerous other diseases. To learn more, please visit our Oral Systemic Connection page. We work closely with you and your general dentist to ensure that you will have a lifetime of healthy, beautiful smiles. Please call us at (302) 456-0400 at your earliest convenience. Our goal is to ensure you can smile with confidence. 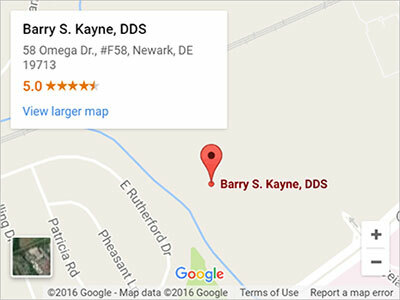 Dr. Barry Kayne is a periodontist in Newark DE who is an expert in treating periodontal disease, or gum disease. Periodontal disease (also known as "gum disease", "pyorrhea" or "periodontal infection") is an ongoing bacterial infection in the gums and bone around your teeth. The infection leads to an inflammation under the gums, and if not treated, can destroy the bone around your teeth. This results in tooth loss. 75% of all adult tooth loss is due to periodontal infection. Click here to learn more about periodontal disease. Dr. Kayne has been providing dental implant care for over 20 years and provides specialized implant procedures such as immediate placement, bone regeneration, implant-supported dentures and soft tissue regeneration. One of his highest priorities is that you understand all of your options for treatment. During an initial examination and consultation, he will go over these options with you. Please do not hesitate to ask any questions you may have.